Gaëlle Tallarida is looking forward to this year’s Monaco Yacht Show (MYS). With plans for an impressive fleet and high hopes for increased interest from the African market, this year’s event will showcase all the major industry trends. What are you most excited about in regard to this year's Monaco Yacht Show? I must admit I am first excited by this amazing enthusiasm expressed by the global superyachting community to trust the MYS for delivering the world’s greatest annual superyacht event. The Show has become a real luxury brand, a top destination for yacht owners and privileged guests interested in entering the superyacht world and live a new experience. Since 2014, the Show’s premium clients can enjoy the MYS Sapphire Experience, a made-to-measure experience, which includes a VIP programme of activities at the Show or private visits to the exhibiting superyachts, in coordination with the exhibiting brokers and shipyards. On the eve of the MYS, we will invite a delegation of new hand-picked visitors to the second edition of the Monaco Yacht Summit. They will meet distinguished experts from the yachting industry who will share inside and unbiased information for a first experience in charter or purchase. Why has the MYS been such a great success over the years? The Show has managed to deliver a top-of-the-range event at each edition. My team and I closely work with the 590 exhibitors and partners to understand and fulfil their needs to display their best products and services. This close relationship with the Show's customers to offer them high quality services, to permanently develop the show with solutions for attracting new prospective clients are the main success factors of the MYS. Our organisation also has the honour to receive the support of His Serene Highness Prince Albert II of Monaco and His Government to position the Principality of Monaco as a natural home of superyachting. Gaelle Tallarida welcomes African clients to the Monaco Yacht Show. Can you tell us what you think will be the showstoppers at this year's event? Every year, the MYS presents an extraordinary fleet of 125 superyachts and megayachts in Monaco’s Port Hercules. Forty of them will make their world debut, unveiled by the most respected shipyards. From 25 to 100 metres in length, all yachts will be one-off models with their own specifications and cutting-edge technologies and innovations. If the MYS superyacht awards will distinguish four of these giant vessels at the Show’s opening ceremony, would you believe me if I tell you that there’ll be 125 showstoppers this year? How important is the African market to the show? The African market may be considered as a new market in future years. Discussing with a few builders or designers about opportunities in this continent, there is a potential market with people that could be interested in discovering the lifestyle of owning a superyacht. And for sure, we would be happy to invite them to the Monaco Yacht Show. What trends have you noticed in the global superyacht industry? For a couple of editions, we’ve been receiving an increasing demand for exhibiting new generations of luxury tenders, outstanding − and fun − water toys or revolutionary innovative solutions to upgrade the lifestyle experience of superyachting. There’s a coming generation of younger owners that want to enjoy a superyacht with families, kids and friends in every aspect. 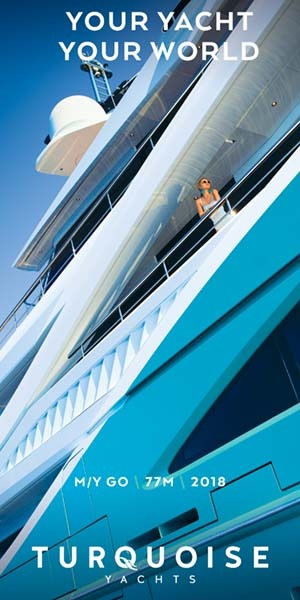 Today, one of the first questions when chartering a yacht is, “What are the water toys included?”. How would you encourage our readers to attend the show? The Monaco Yacht Show is the only occasion in the year and in the world to visit an outstanding fleet of 125 superyachts and megayachts in the glamorous backdrop of Monaco. Every year, the fleet is different. You have one chance in a year to admire all these yachts. Don’t miss it. We look forward to seeing you this September.